If you've been to an American bookstore in the past decade, the odds are good that a cover designed by Peter Mendelsund has caught your eye. Despite scant formal training, he has managed to create some of the most recognizable—and most celebrated—book covers of the past decade. This week, Mendelsund (who is the associate art director of Alfred A. Knopf) publishes two books: What We See When We Read—in which he dissects the experience of reading and the phenomenology of "picturing" what the author describes—and Cover, a design monograph featuring everything from his discarded drafts to his most iconic book jackets. Both books provide insight into the designer's process and push us to reconsider what we think we know about the graphic representation of words and ideas. Amy Weiss-Meyer: Could you describe the process of how you come up with a cover for each book you design? For example, how did you arrive at the now-iconic cover of the Stieg Larsson’s Girl With the Dragon Tattoo? Peter Mendelsund: That's kind of an anomalous one in that there were so many other people involved in the approval process. There was a lot riding on the cover working. I did a ton of different variations to get to what we landed on. That process is not really the way I normally work. For one thing, there's slightly less scrutiny on what I’m doing, which is great—and maybe more conducive to creating a good cover. Normally what happens is I get the manuscript pretty early on, often unedited, and I'll read it, and I'll mark it up. I used to think [before writing What We See When We Read] that I would read a book, and I would see something in it, I would imagine something, and then I would sit down and I would just render that something. But that is not the way that happens. It's more that you're making something out of whole cloth. You're enacting the book in a certain way. I mark up the manuscript and I pull out pages that I think are particularly pregnant with significance. And then if it seems like it could work as a jacket, whatever that word or expression or phrase is that I’m trying to convey, I’ll start sketching. Sometimes it's just like a squiggle, just a very loose conceptual idea, and so I sketch the things by hand really roughly, and the reason is on the computer everything is so rendered. There's something about the looseness of pencil and paper that keeps you from getting too tight—I can work very conceptually that way. I've been charged with solving a problem and when I feel like I've solved it, then I show it. And then when I have something that I think does the job that it's supposed to be doing, I'll show it to the editor, and I'll show it to my boss, Sonny [Mehta], and we'll talk about it. If there are things the cover's not accomplishing that it needs to accomplish, I'll go back to the drawing board and start again. I tend to show one cover at once. At other houses, it's much more common to show a bunch of different versions. We don't do that at Knopf and I feel strongly that that's the way to go. I've been charged with solving a problem and when I feel like I've solved it, then I show it. AW: Do you think you have a particular knack for representing the feeling of a book based on your interpretation of it—are you able to take your personal experience of reading and translate it into something that's universally identifiable as signifying a certain idea? PM: I think the most import thing about being a cover designer is being a decent reader. If you haven't read a book well, [and] you just throw an image on it, chances are you're going to fail at representing it. On the other hand, if you do use imagery that's broad enough, then you want something that'll serve as a universal emblem to the book rather than one particular reading of it. AW: You mentioned that your ideas about visualizing books changed in the process of writing What We See When We Read. How did you come to write the book if you hadn't already realized that "seeing" what we read is just a metaphor? PM: My ideas about reading and design were very similar to the ideas that most people have about what reading is—that it's this somewhat passive process in which you are seeing what the author intends you to see. I think if I had ever really stopped to think about it, I would have thought, "Well that's absurd." AW: The cover of What We See When We Read is very minimal. It’s black, with a drawing of keyhole. How did you arrive at this cover? Isn't it harder to objectively interpret the significant aspects of your own writing? PM: That one was really difficult, especially because of the subject matter of the book. When we read we don't see in the optical sense. Here, I'm charged with putting something on this jacket that is something that you look at that represents the book which is about the opposite of that. So I tried about a bajillion things and they were all really bad. and it occurred to me, what if I tried to visually describe the feeling of not being able to see something. That's when the keyhole thing sort of came to me. I'm still not sure if I like it or not but I don't think I would ever be happy with the cover of this book. AW: Is there a cover you've designed that you regret, or would change in hindsight? PM: I try not to think about that because it's such a Pandora's Box. I would probably change all of them. There are very few of them that you wouldn't change. Luckily, I have so much work that I don't have the time to sit down and get too neurotic about it. But being the kind of person I am, I would probably keep tweaking [my covers] indefinitely. AW: Is there one particular cover that sticks out as having had a particularly high amount of discarded versions before you settled on the final one? PM: [What We See When We Read] is a contender. I take my job really too seriously, but I take it really seriously. So when I'm doing a cover for somebody, I tend to do a lot of [versions]. I'm not talking about showing [covers] to people and them getting rejected a number of times, I'm talking about before I show a cover, especially for a book I really care about—and you could put my own book in that category, but also the works of Kafka, or Dostoyevsky, or Tolstoy—I tend to do sometimes hundreds of different versions before I’m satisfied. So it really isn't that unusual that I'll do a lot of versions of something. By the time I showed the one with the keyhole, I wasn’t convinced it was done. It took other people to be like, "You're done." Hopscotch is [another] book that meant a lot to me, and there wasn't anybody overseeing the process, it was just something I decided to do. There was nobody stopping me from making covers, so I could have just gone on indefinitely. I think that was the most covers I’ve ever made for a single book. I worked on that for months. I just couldn't stop. AW: Is there one book whose cover seemed to design itself? PM: Ulysses. It just became kind of obvious. The hardest thing to do in a design is just to not do anything. As a designer, you predicate your job on finding interesting visual conceits, so we always end up being more clever than we need to be. I thought I would just set the type and let the book speak for itself. Ulysses. James Joyce. What else do you really need to know? And I saw the “yes” in it. You don't have a lot of professional epiphanies in life, but seeing that "yes" was very exciting for me. There used to be a little bit of debate about whether or not [Ulysses is] an optimistic or pessimistic book. And for me, it's always been an optimistic book about love and human connection. And so to see that word in its embedding made me really happy. I would say that cover probably took a couple hours at most. AW: What's your favorite book cover you didn't design? PM: One of my favorite book covers is a Russian constructivist cover by a wonderful artist and designer named Olga Rozanova. She did a book cover [for Transrational Boog] that I just find so touching every time I look at it. It's really simple. The typography’s totally simple. There's a paper cutout of a red heart. For some reason every time I see that cover, I just feel immensely moved. It’s formally perfect. It uses the slimmest of resources. And then the fourth wall being broken by the actual button [attached to the cover]—I find that very exciting. A heart is the most cliché thing in the goddamn world, but there’s something about the way that it's rendered. It's very abstracted, and the quality of the red is so deep and beautiful, and that gesture of the button is so unexpected. I've always loved that one. AW: What book cover has gotten more acclaim than it deserved? PM: I never liked the cover for The Great Gatsby, the first edition, and I never really liked the first edition of The Sound and the Fury either. They both seemed just off to me. I always wished [the cover of] The Sound and the Fury were more beautiful. It just bears no relation to the book that I read. AW: In your introduction to Cover, you write, "Book jackets are trivial and unnecessary." Does that mean you don't look at them yourself? PM: I do look at them myself, I have to as a book cover designer, but I wish I didn't. I remember a time even twelve years ago before I was a designer where I’d walk into a bookstore and the only thing I’d pay attention to was the author's name and the title. And that was a wonderful pre-lapsian moment. These things we make, they're tools for selling [books]. And as someone who works for a publisher, I'm part of that marketplace, and I take that seriously. 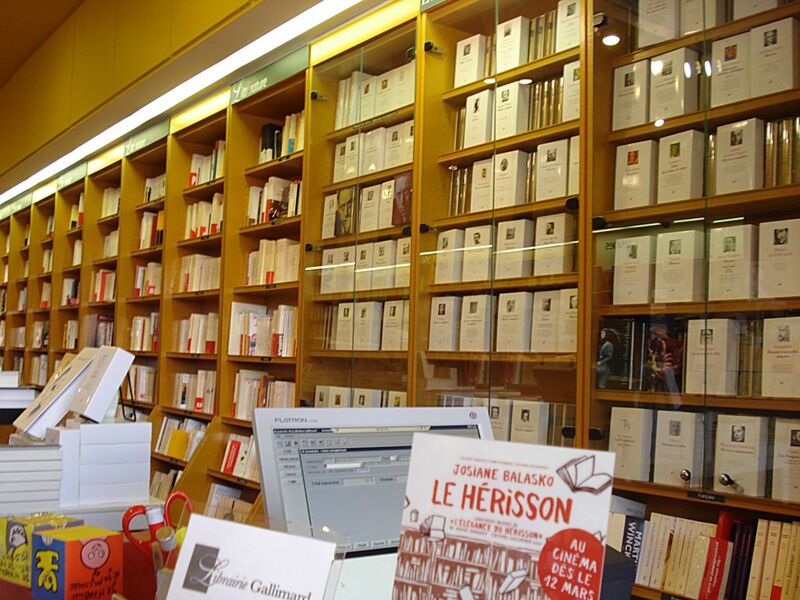 AW: How do you react to French bookstores, for example, where all the books look the same? PM: I love that, those are my favorite kinds of covers. Sometimes at home, if there's books I really love but I don't like the covers, I’ll just wrap them in brown paper and put a sticker with the title on it.